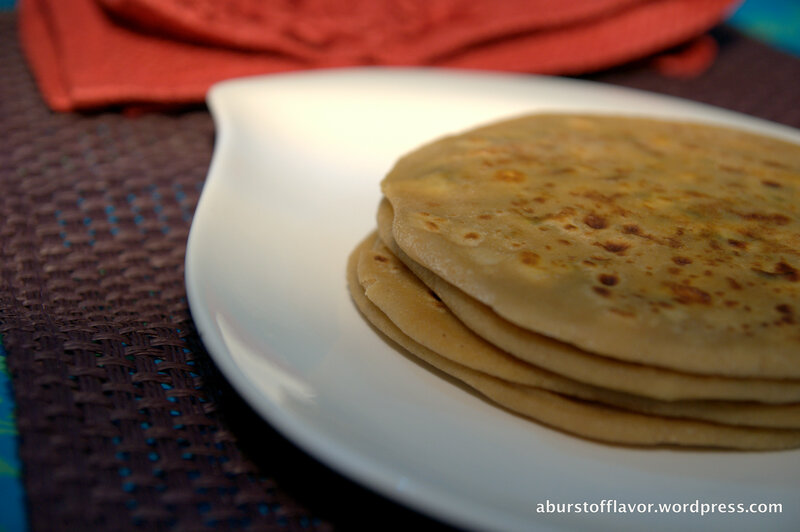 Paratha is a very versatile Indian flatbread that can be made plain, or with a variety of stuffing. The range of stuffing includes lentils, greens, beetroot, carrot, radish, potato & peas, mixed veggies etc. Parathas are tasty & very filling since they are quite thick. Just one or two of these parathas with some pickle and yoghurt would suffice for a satisfying meal. That’s the way its generally eaten because any other side dish would make it too heavy. They also taste great paired with any spicy Chutney or Ketchup. One of the most popular fillings for Parathas is ‘Paneer’ or Cottage Cheese. 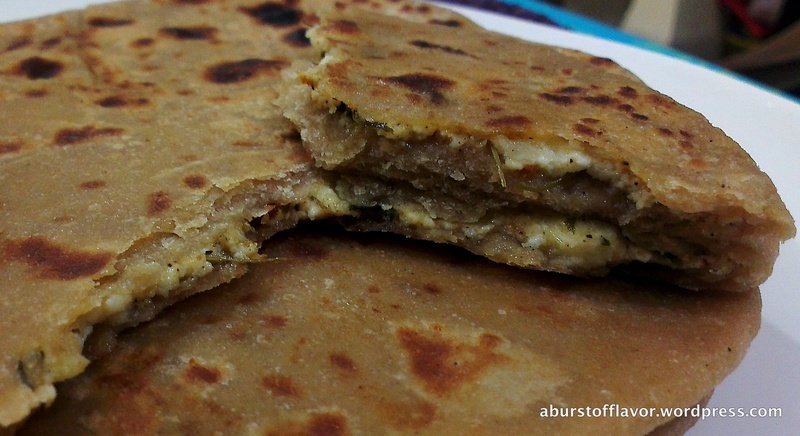 There are umpteen varieties of Paneer Parathas themselves, and this simple Methi Paneer Paratha (Indian flatbread stuffed with a spiced mixture of cottage cheese and fenugreek leaves) is one of them. The aroma and flavor of Methi perfectly compliments the creaminess of the Paneer. With very little spices, the individual flavors shine through and make this amazingly yummy! Now, please do not get scared looking at the length of the recipe 😀 ! I have just tried to be as thorough as possible with the instructions. This should take you about 5-7 mins to make the filling, 5-10 mins to knead the dough, 15-20 mins to roll out the parathas, and about another 15 mins to fry it on the griddle. Overall, it may sound like a lot of work, but it actually comes together pretty soon once you get your individual components ready. And of course, the end result is completely, lip-smackingly worth it. Take 2 cups of flour in a mixing bowl. Add salt and mix well. Make a well in the flour and add the oil and water. Now mix well and knead the flour by hand gently, adding water until the dough is nice and soft, but firm in consistency. If the dough is sticky, it means there is excess water. So add more flour and keep kneading till smooth. If the dough is rough or dry, it means it needs more water. So add water little by little and knead until smooth. Cover & let the dough rest for about 30 mins. Divide the dough into 6 separate balls and set aside (no need to be perfect about the apportionment). Crumble the paneer by hand in a mixing bowl. Add the rest of the ingredients to this and mix well by hand until well incorporated. Set aside. Take the reserved ¼ cup of flour in a small plate. Sprinkle some of this flour on a flat, clean rolling plate (or whatever is your kitchen work surface). Additionally, you could also rub some of this flour on your rolling pin as well. You are basically flouring the surface so that your dough does not stick to it when you make your parathas. Take one ball of dough, dredge lightly in the flour, and flatten it with your hand. Roll out into a small disc with the help of your rolling pin. Place 2-3 tsp of the paneer filling in the middle of this disc. Now pull up the edges of the disc to close over the filling by gently stretching the dough. Repeat until entire filling is covered by dough. Press down in the center to spread the filling gently. Press down on the gaps if any, to seal them. 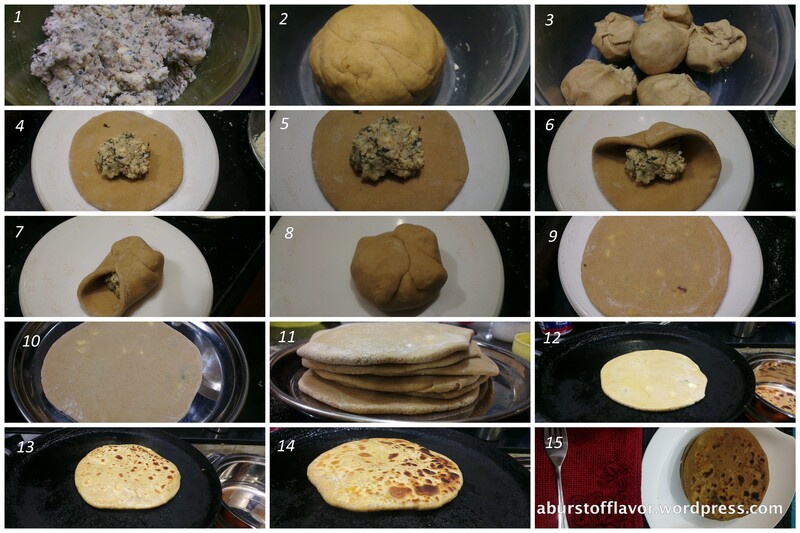 Now roll the disc gently into a slightly larger paratha (dip in flour if necessary) Do not apply too much pressure while rolling, else the filling will leak out. You can stack the rolled out parathas on top of each other on a plate. Heat the tawa/griddle on a stove. Fry the parathas on a hot griddle / tawa, on medium flame, by smearing oil on either side of the paratha. 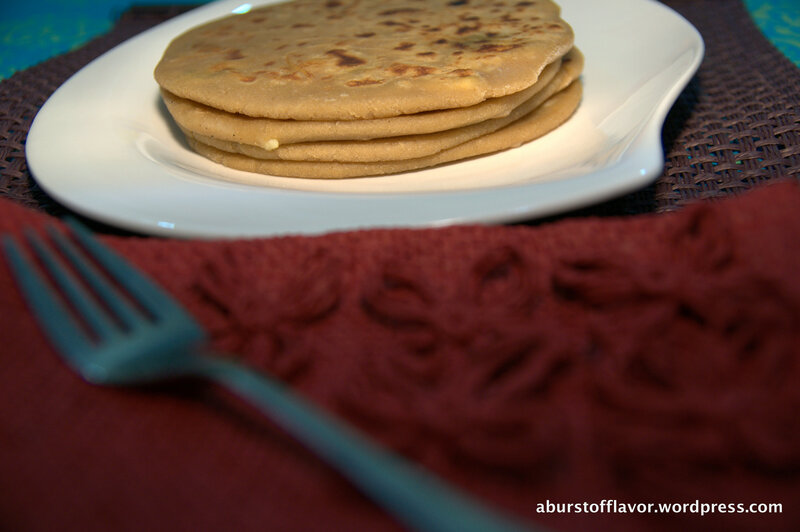 Fry until the paratha is cooked and golden brown spots appear on both sides. Finally, take the paratha off the stove, and apply ghee on both sides while still hot. I stacked the ghee-smeared hot parathas in a casserole and it kept warm & soft for upto 2 hours.